When designing structural members they can be subject to a number of forces such as Shear, Tension, Compression, Torsion and combinations of these to name but a few. 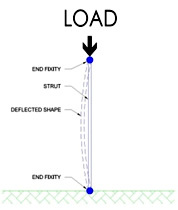 Generally speaking, when we look at structural members, be it beams or struts, the Compressive force element is predominant in determining the structural capacity and the failure mechanism. 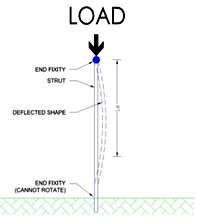 In this example, if the ends of the strut are held in place in all directions then the effective length Le is equal to the length of strut. Now if we introduce a support in the middle and prevent it from moving in all directions the Le becomes half the strut length. This is critical, if we started for example with a scaffold tube of 2m it would have a strut capacity of 29.1 kN (TG20:08 Table 20). By reducing the effective length to 1.0m the strut capacity increases to 58.6 kN. Now to throw in a curve ball. If we fix one end of the tube in to concrete so that it cannot pivot or rotate, although the length of the tube is still 2m, it now has an Le of 1.4m. So our 2m tube in the last example can carry 45.3 kN – much more than a tube of the same length restrained as in condition 1. Q. 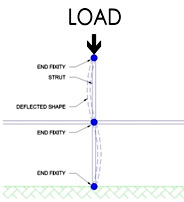 So what is the effective length of a standard in scaffold design? A. It is not the lift height necessarily, as we have different Le’s depending on the tie pattern and which standard we are looking at. For more guidance on this refer to TG20:08 Appendix D and Table 37 or BS5975 Annex K.